You may also use your videos hosted on YouTube and Vimeo servers. With video widget, you may add, edit or remove video tracks from the list, also rearrange tracks; you can allow sharing tracks via Facebook, Twitter and lifetime comments. Click "Add Video" button to add a video. If you have your video hosted on external server (Vimeo, YouTube, or any other hosting server), add a link for that video file. Make sure that you files are in mpeg4.H264 (iphone), mpeg4.H263 (android) or 3gp format. Your files should have the ".mp4" or ".3gp" extension. If you do not know how to check your files extension, then you should refer to your OS documentation. If your file isn’t an mpeg4.H264 (iphone), mpeg4.H263 (android) or 3gp then you need to convert it to mpeg4.H264 (iphone), mpeg4.H263 (android) or 3gp . There are plenty of special software and online services for converting video files from one format to another. http://www.any-video-converter.com/products/for_video_free/ is an example of the software. http://www.online-convert.com/ is an example of the online service. No matters where you store your video files - on your site or using a hosting service - but it should be available directly and have public access. If you want upload your video file on iBuildApp’s server, choose "Upload" option In the "Add video" popup window; locate your video file, enter video title and description. Then click "Save" button. Supported formats: avi, 3gp, m4v, mov, wmv, mpeg, mp4; maximum file size - 20Mb. 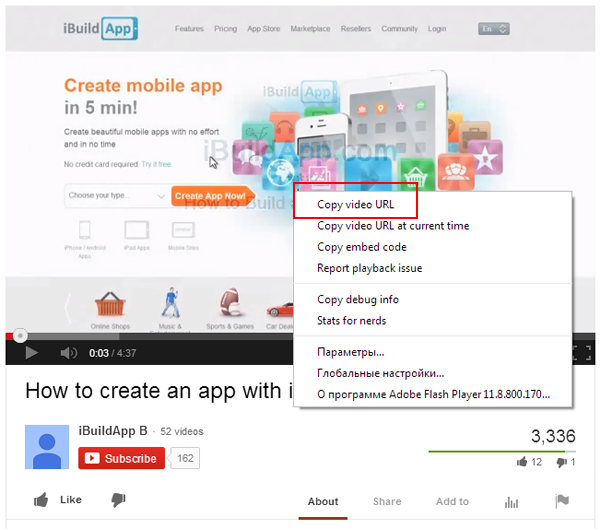 Go back to iBuildApp.com, choose YouTube option In the "Add video" popup window; paste the link and click "Save" button. Video details, including title and likes, will be shown within your app. Go to Vimeo.com site and choose the video you would like to embed into your app. 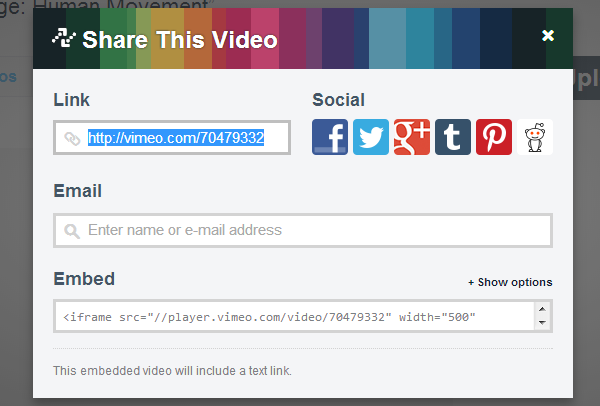 Click "Share" button (that appears when you hover your mouse over the video player) and copy the video url. A screen will pop up and you can copy your video link. 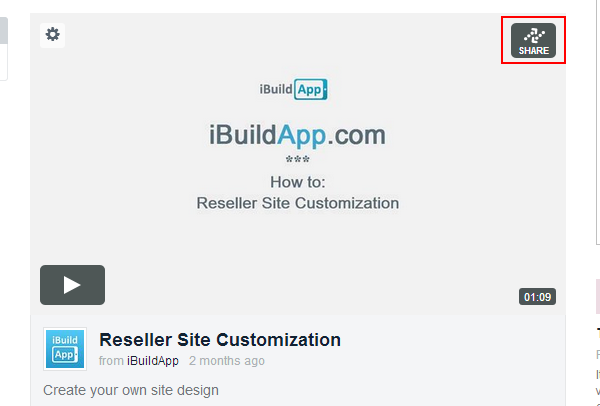 Then go back to iBuildApp.com, choose Vimeo option In the "Add video" popup window; paste the link and click "Save" button.